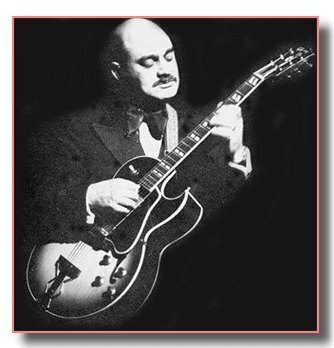 Joe Pass (1929-1994) has been rightfully called "the president of bebop guitar." His efforts represented a gigantic step forward in the evolution of the instrument. With Pass the fluid lines and advanced harmonic concepts of sax players like Charlie Parker and John Coltrane as well as pianists such as Oscar Peterson, Art Tatum and Bill Evans crystallized into a powerful and potent guitar approach. Early in his career he was the consummate bop musician, astonishing listeners with fleet and innovative single-note melodies. By the end of his life the virtuoso had carved out his own unique musical niche, improvised jazz guitar as chamber music, with a breathtakingly beautiful solo guitar style. Joe Pass Guitar Style. Written by Joe Pass and Bill Thrasher. Joe Pass Guitar Solos. By Joe Pass. Joe Pass Chord Solos. By Joe Pass. Joe Pass Guitar ChordsBook 1. By Joe Pass. All from Gwyn Publishing Company. These books from the early 1970s are definitive documents of Pass guitar style. Guitar Solos concentrates on many of his superb Pacific Jazz single-note solos including "Django," "C.E.D.," "Forward Pass," and "What A Shame." Guitar Chords and Guitar Style are tutorial volumes which shed light on Joes approach to harmony and improvising. Chord Solos is a fine collection of Pass Virtuoso-style chord-melody pieces. Jazz Duets. By Joe Pass and Herb Ellis. This interesting book from 1973 features two-part jazz counterpoint pieces from the Joe Pass-Herb Ellis pairing. A superb 1997 collection of Pass earliest recorded work from the Pacific Jazz period, 1961-1964. Especially worth checking out are the cuts from Sounds of Synanon, Catch Me and For Django. Perhaps Pacific Jazz will see fit to release these three albums in their entirety. A wonderful and rare live bebop set from the For Django period of 1964. This 1995 reissue is currently the only available live recording of early Joe Pass; which makes it worth owning for that reason alone. Virtuoso, Virtuoso-Vol.2, Virtuoso-Vol.4 and Virtuoso-Live! Appropriately named, these solo performances defined the improvised chamber music of Pass jazz style.